Before anything else, I'd like to extend a huge thank you to everyone who has signed up, everyone who sent in a donation, all our ambassadors and my co-hosts! 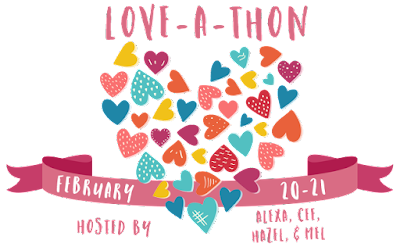 The Love-a-Thon this year would not have been possible without all of you lovely people, and I feel well and truly chuffed by the support. In tried and true Love-a-Thon tradition, everyone was asked to kick off the event by writing up introductions to themselves! We sent along a questionnaire as a guide for this post, and I'm looking forward to reading everyone's answers - whether I'm encountering them for the first time or seeing updated answers from old friends. But first of all, I've got to make my introductions! Since I've done a couple of introduction posts already (see here, here and here), I decided I'd do a little vlog this year to change things up. In case you guys didn't already know, I actually have a YouTube channel and have been working on being consistent with video uploads on it this year. (I'd love if it you subscribed!) Here's my video response to the questionnaire! This year, we're very lucky to have so many generous sponsors offering prizes! There are two Rafflecopter forms below, one meant for US participants and one meant for INTERNATIONAL participants. Please make sure that you enter the right giveaway! All giveaway entries WILL be verified.